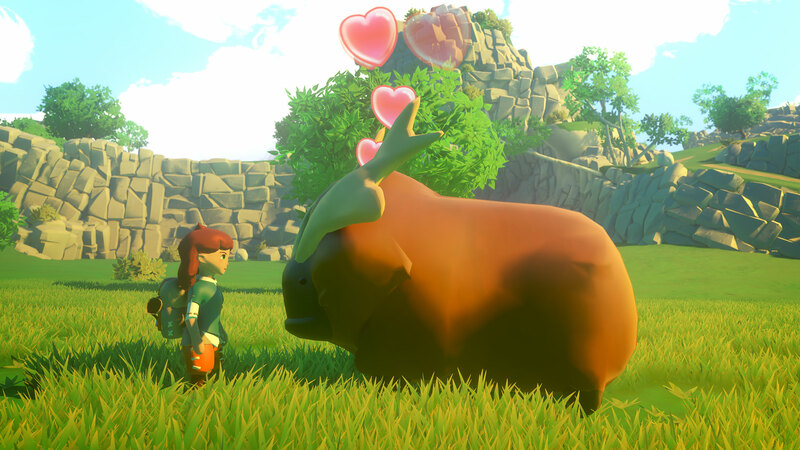 Yonder: The Cloud Catcher Chronicles is an open world adventure game developed and published by Prideful Sloth. 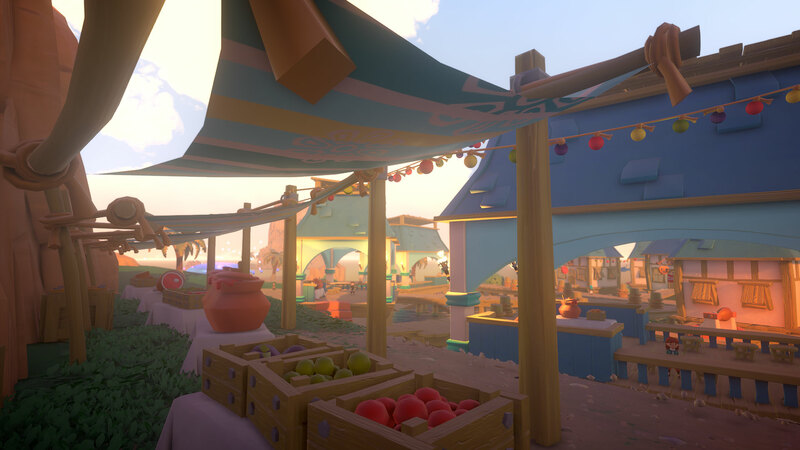 Yonder starts out with your character on a ship, sailing towards the island of Gemea, hoping to find some answers regarding your past. The ship crashes, you wash ashore, and you eventually find some inhabitants that will help you get acquainted with the island and how to forage for resources. From there, the world is at your disposal, and you’re free to pursue your goals how you see fit. You also learn that there is a spiritual side to this island, which only you can see. There are creatures called sprites scattered about, and they aid you in removing something called Murk. Murk are these big purple fog splotches littering the island that make life rather difficult. They block off progress into certain areas, and also contain various goodies. Your ultimate goal is to find some clues about your past, and try to solve this Murk problem. Most of the game consists of finding quests and completing them. This usually results in obtaining some items or crafting recipes. The game bills itself as being pacifistic, and it certainly stays true to this. The most violent thing the player does is chop down a tree. 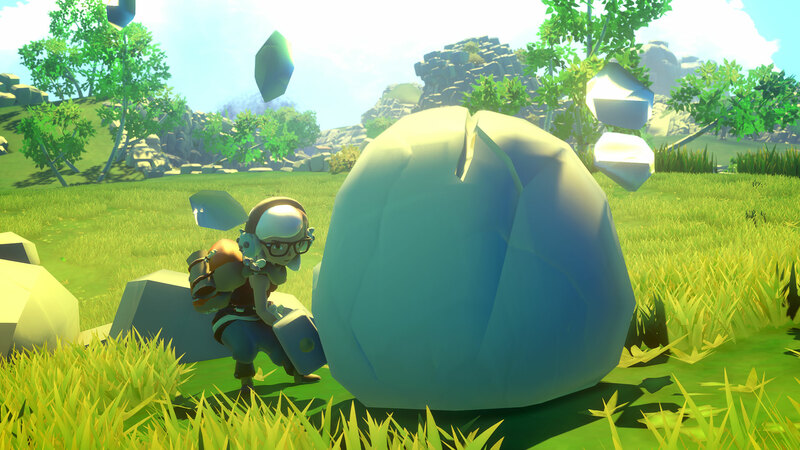 Most of the quests involve finding some particular items, whether through foraging, crafting, or trading with merchants. 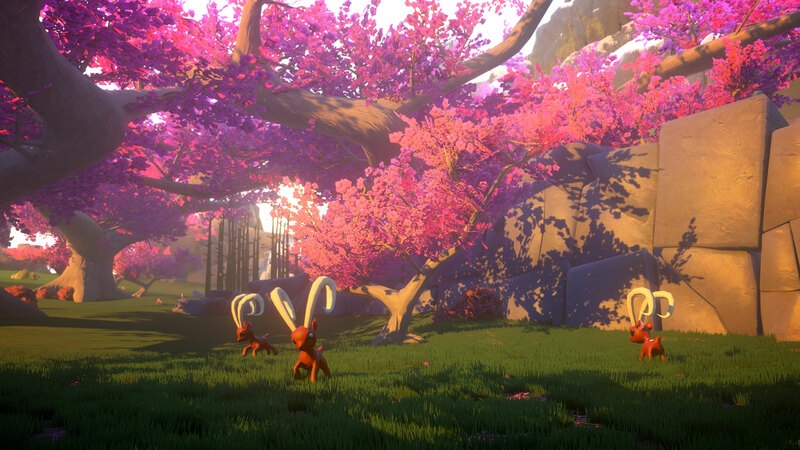 Yonder has a pretty critical flaw though, which is that there’s really no incentive to explore a lot of what it offers. Going through the main quest requires a little bit of crafting and foraging, but not much. By the end of the game, there were still many crafting recipes I hadn’t found. There were even pretty big sections of the world I never went to. The farming aspect seems like an almost superfluous addition here. The only thing you can do with farming is adopt animals, and every now and then, you get some product from them. The local livestock called groffle will give you milk. Most of these products are only useful in trades, and there’s really very little reason to ever trade with anyone. Not to mention that adopting animals is a pain. You have to figure out what kind of food an animal likes, feed it to them, and very slowly guide them back to your farm. The story and most of the game’s content just feel at odds with each other. There’s no reason to experience a lot of the game if you just want the story. Side quests generally only give you resources for crafting. Resources are used to craft items just to fulfill other side quests. Then there’s farming, which is also lacking. There’s no reason to actually maintain the farm unless you just get some satisfaction out of seeing a bunch of animals on a farm. The story is also fairly bare bones. A large portion of the story involves just going around doing fetch quests at various places. You get to the end, you solve the mystery, and it just spits you back into the game world. I feel like this game tried to do a few too many things, when it should have focused on just a couple. I get having an open ended game with exploration, but there should be something to strive towards—exploration rewarded by interesting characters, locations, or items. Crafting and farming could also have similar rewards. I don’t even think any of the systems are inherently “bad,” it’s more that there’s a lack of incentive to play around with them. I suppose the one thing Yonder does pretty well is provide a nice looking world to explore. The game does look good, and has a bit of a cutesy artstyle to it. All the animals are these adorable mashups of normal animals, like the previously mentioned groffle, which is a combination of a cow and a moose. There’s also nice music unique to each distinct “zone.” Most of the music features very calming and peaceful violins that fit the non-violent nature of this game. The story took me about nine hours to get through, but I also did a decent amount of side quests. It’s currently $20 on PS4 and Steam. If any of what I said sounds interesting to you, despite the fact that there’s very little point to doing most of anything in this game, then perhaps it’s worth a look. I could certainly see this game being very relaxing to some folks, if you just like exploring for its own sake.